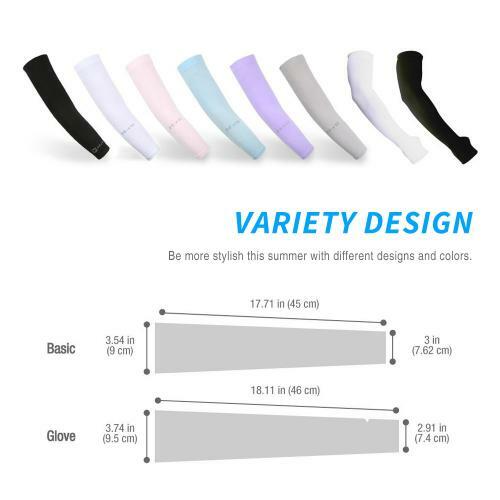 AccessoryGeeks.com | N-Rit White Tube 9 Cooling Arm Sleeve w/ UV Protection - UPF 50 +! | Free Shipping! These are great! They provide both support and warth when used for tennis. Quick delivery and each and every item was of excellent quality! Thanks, Geeks! I'm extremely pleased with this product. Used it for gardening and save me the hassle of putting sunscreen. I would buy again as the need to replace arises. Thanks, Geeks! Great product! I use these sleeves to cover up my tattoos at work, so they get daily use. The fabric is very nice, fits great and firm and snug the way I needed. Such a great deal! What a deal! These are perfect for my everyday summer wear when playing, working in the garden, or working out. Compression is very light, really cool, and keep my skin well protected. Fit perfectly and is comfortable to wear while playing softball. Great product that offers good support and keeps me feeling cool and warm. I bought them funny enough not to work out but work to cover my really bad eczema all over my arms without having to wear layers in the hot summer. They didn't cover but actually help heal my skin. It's great and affordable. Seems seamless and definitely help keep my arm warm. Also, I wear them while riding my motorcycle in the summer heat. They feel so good! Fit well, not too tight, and good quality materials. These are perfect outside with short sleeves and still want to golf. I have never had a sunburn while wearing these sleeves. I've been very happy with my arm protection. They wash well stay put on my arms. Surprisingly comfortable and keep the sun off my arms and they never slip down. Always good to wash in cold and hang dry. Great sleeves... It almost perfect! I bought this arm sleeves for my husband and he used them in Arizona when golfing to block the UV rays. Thanks Geeks! I wear them in the summer while riding my motorcycle. It help to keep my arms nice and cool. Material feels way better than other compression sleeves I have purchased in the past. I used them as well I'm at the gym on my arms days and I also wear them several hours at outside activities afterwards. These are a lifesaver to protect my arm against sun protection. Good quality product at a great price. Good arm sleeves compression and I use them to keep the sun off my arms. Arrived on time, thanks Geeks! Excellent sleeves, I was needed requirement in a hot working environment and wearing a long sleeves shirt for sun protection. I will be purchasing more for the holidays. I got these for my son who does a lot of bike riding. This will help and protect him from the sun'strong UV Rays. It gives just enough comfort, good quality and affordable. Surprisingly comfortable. They keep the sun off my arms and they never slip down. Amazingly cool in the sun while playing golf. Highly recommended. I use this mainly to keep my arms from sweating while on an elliptical and it works. I was also impressed at how these made my arms feel a little cooler as well. I love them! Great fit and the fabric is very smooth and comfortable to wear. Keeps my arms cool and protected from sun damage. Pretty cool! It fits very well, very useful and very comfortable. I can used it in biking, gardening and other outside activities. Feels me cool in hot summer! Definitely block the sun for my arms! I used them for road biking and driving a car. These are awesome sleeves! And price was good. I highly recommend them. Thanks Geeks! Very satisfied! Every time I wear it, I am surprised that I feels coolers even in direct sunlight. Helps keep me cool, I work all day as food service delivery and they help in the hot summer. Well made quality product and this is very comfortable to wear. I use this mainly to keep my arms from sweating while driving or works. Made my arms feel a little cooler as well. Just love this arm sleeves! Perfect for needs specially on my everyday jogging, biking and other outside activities. Provides a great protections against the sun. Keeps me cool! Thank you for these arm sleeves. I am wearing them in Arizona while bike riding and playing basketball. Great product for the purpose. I just love these! Perfect for my needs. I will keep ordering as I use them all the time. Thanks! My husband wear these arms sleeves on his golfing. They are cool in the summer and warm in the winter. It has allowed the sun damage on his arms to heal. Finally I got these wonderful arm sleeves that give protection against sun damage. Very useful and convenient to use. I will definitely buy it again. Great protection for outdoor activities. Every time I wear these it feels cooler even in direct sunlight. Very satisfied! Very good quality. I play golf regularly and they keep my arms cooler and protected from the heat of the sun. Super comfortable and very useful. Allows me to be out in the sun without to put sunscreen on my arms. They keep my arms cooler and protected in hot summer. Nice product especially for the price. Great and super comfortable to use. Keeps and protect my arms from the sun when I'm playing soccer during the afternoon. Great price too! Absolutely love these arm sleeves. It fits great and cover my arms from heat of the sun. Highly recommended. Good quality arm sleeve. It does my arm cool, really strong and well made. I will definitely buy it again. Keeps my arms cooler in the hot summer. Allows me to be out in the sun even without having sunscreen on my arms. Thanks! I love this arm sleeves! They are very useful since i was working in construction site and I like how they feel and it fits for my purpose. To protect my arms. Great and highly recommended. Came in on time and they are nice. 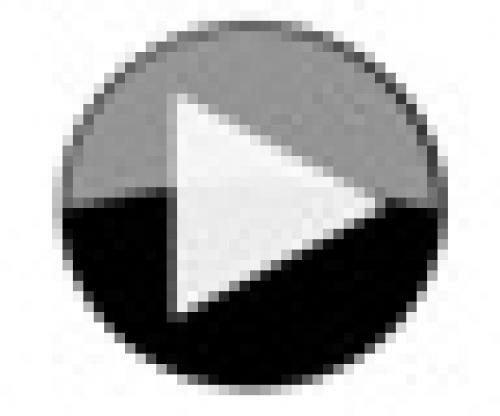 Good compression. 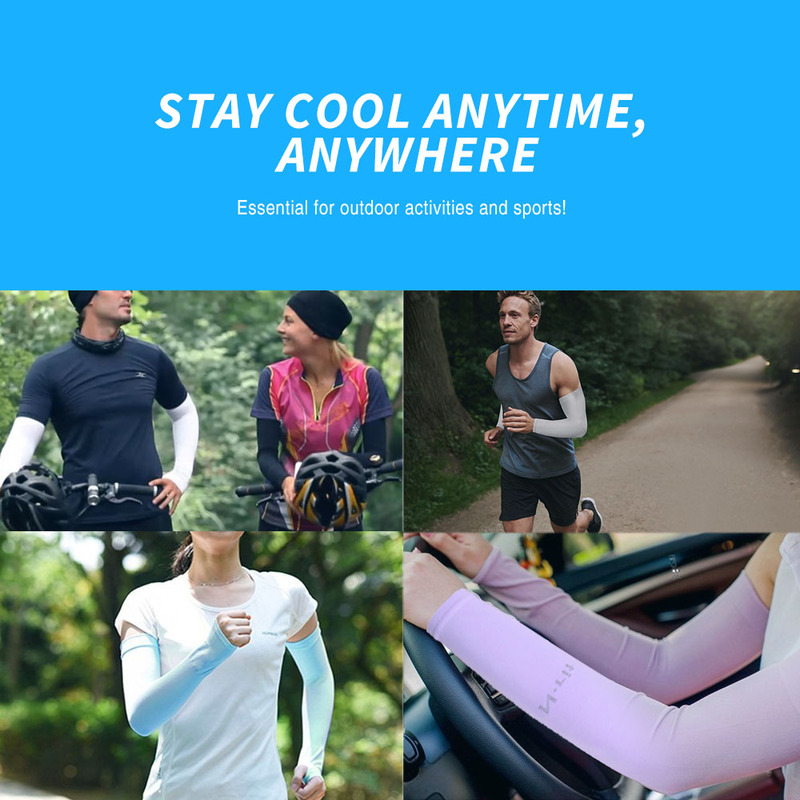 Sleeves are really nice and great sun protection. Great sleeves and super comfortable to protect my arm from the sun during my outdoor activities. Highly recommended as they feel awesome and not expensive at all. Keep my arms cool! 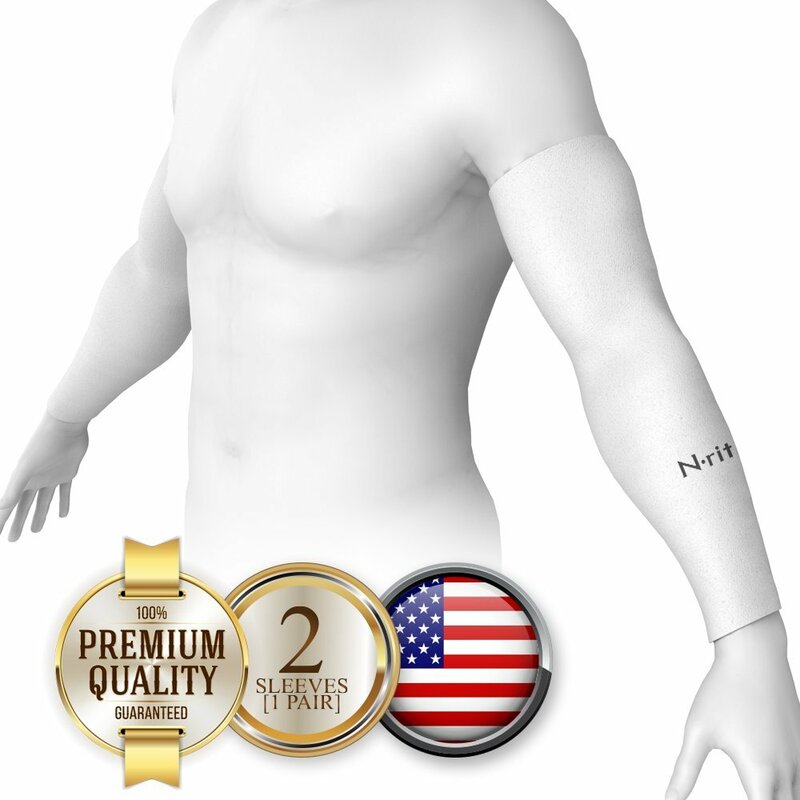 High quality material and it provide sun protections specially on my outdoor activities. Great value! Awesome Sleeves! 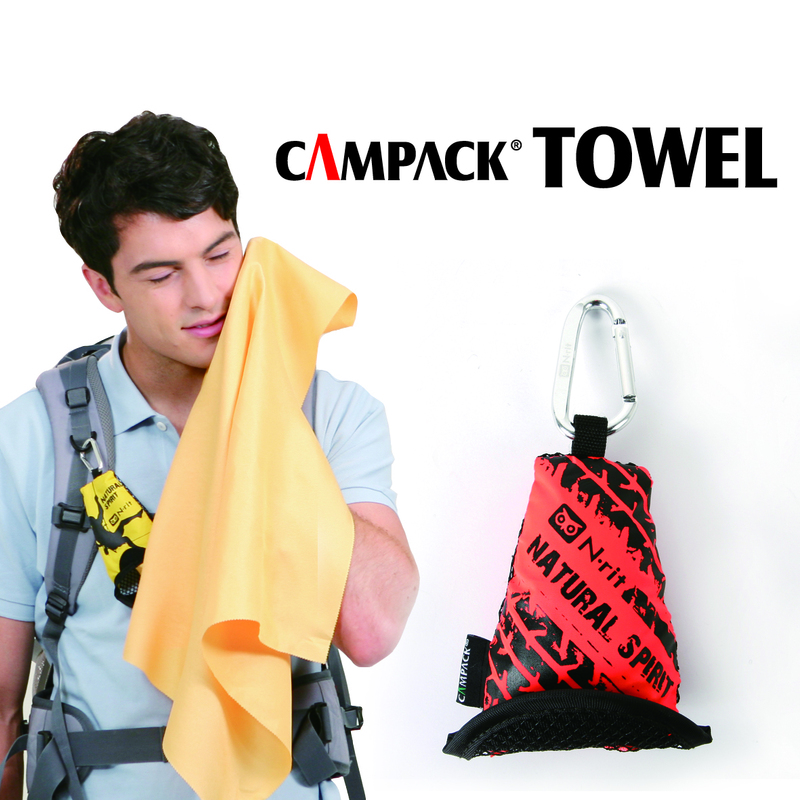 It provides sun protection and keep my arms cooler even on outside activities. Price is right and fast shipment! Thanks Geeks! Pretty good. These are super comfortable and protect my arm from the sun. Great for outdoor activities. Highly recommend as they feel awesome and are not expensive at all. Great sleeves. Fit perfectly and are not too snug at all. I use them for work outside and they feel great with the heat. Keeps me protected from the sun. I bought these sleeves for a friend with an injured arm. 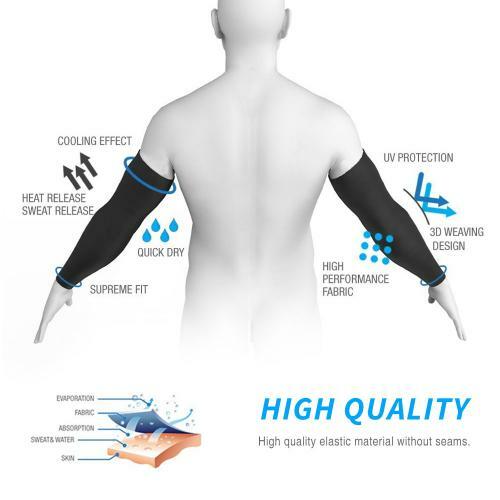 These sleeves help protect it and reduce the pain. Very helpful and I am very pleased. 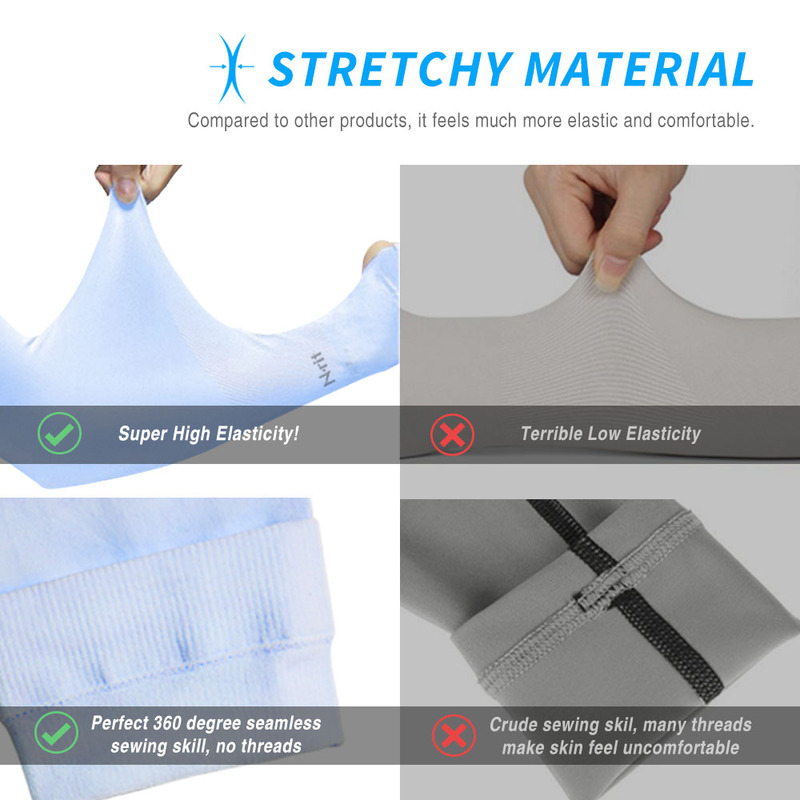 Wearing this cooling compression sleeves feels me cool and comfortable. This is durable, beneficial especial on my outside activities. I'm very happy with these, I'm feel protected. I wanna share this protection for my friends as a gift! It keeps my arm cool, Awesome! And this is really strong and well made product, lightweight, cool & UV Protection. I will definitely but it again for my self and friends as a gift for coming Christmas. Its pretty good and cool! 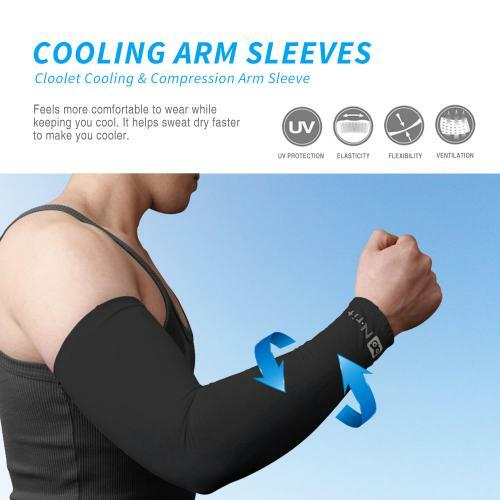 Great cooling compression, its protect my arm during my gardening and other outdoor activities:) Happy in my purchased. Great fit, good quality materials, stay tucked and do not slide down my arms. I wear this in my biking, gardening and other outdoor activities. Job well done with priced right. Every time I put it on, I am surprised that it feels cooler even in direct sunlight. Definitely, i will ordering more of these! Satisfied. I've used them several times and they do a great job, good quality, cooling sun protection, and great value. Cool! They really do the trick, are very comfortable and are very reasonably priced.The fit is good though they are a little long - rolling up a turn or two works fine. They are comfy and easy to put on and of . I will recommend is product to my relatives. I received these sleeves at the perfect time. I had just had a PICC line put in my left arm and had fallen. Which caused an injury to my right arm. At first look I was a bit concerned about using them. Because of the black elastic strap at the top. I was worried it might cut of my circulation. Well they didn't they fit snugly. They stayed in place and covered my arm preventing it from infection. It also kept my tubing I place so that it wasn't hanging out everywhere from my PICC line. I know that using them for the reasons I did are above and beyond what they are made for. Their performance was second to none. They washed and dried perfectly. I used a garment bag on cold and air dried them in the dryer. They also didn't generate a lot heat. So I didn't feel like I was sweating all the time under them. Purchase these for both kiddos for sports practices and games, they absolutely LOVE them!! My son even wears them to school on sunny days to cool his arms during yard play. It helps my daughters sensitive skin getting bumps from over exposure under the sun. They are true to size, fit great and do not run off!!! I borrowed these from my husband and he will never get them back! I originally bought these for my husband for sun protection while golfing then borrowed them today to try out myself for tennis. They are great! They provide sun protection without sunscreen and they did seem to keep my arms cooler in the sun! So I just bought a second pair to keep everybody happy! These sleeves are awesome! I have used them to on several runs in the heat and they do keep me cooler. They don't slide at all. Great price and speedy delivery! 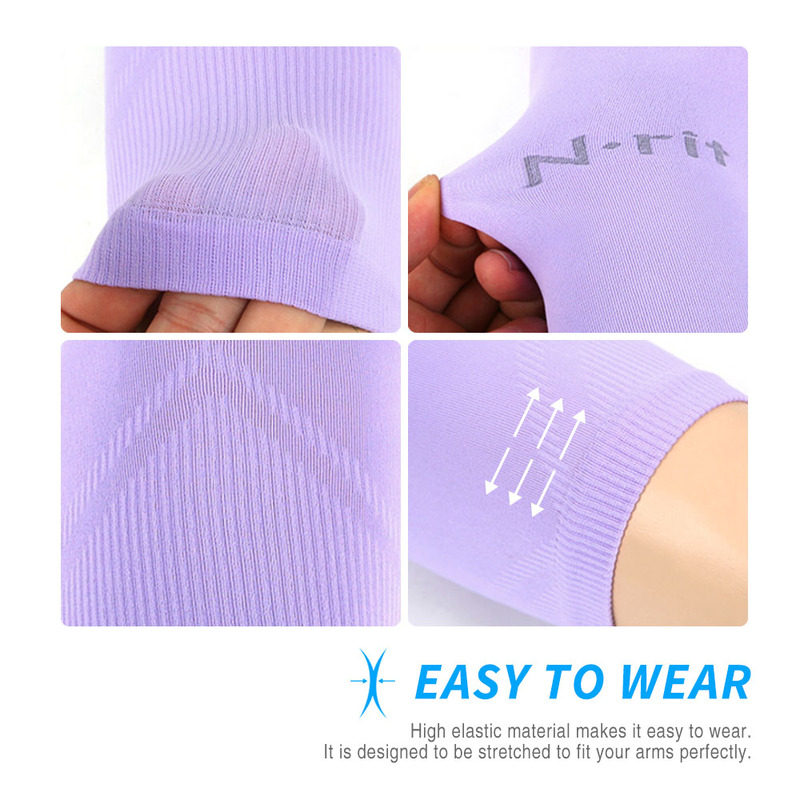 This is the Compression Sleeve to get. Awesome product. I ordered it because of pain I was having in my arm and it worked out great and I feel much better. I ordered the medium and it was just the right fit, not too tight, not too loose. This is the second pair I have bought. I have not received them yet but if they are like the first pair, Great! The quality of these sleeves were way better than the other sleeves I had purchased from Amazon. They fit good and felt comfortable. I don't know about the uv protection yet, haven't used them enough times to tell. My guess is they will help with the uv. I will buy another pair soon.